Ride an excavator, one of the pieces of construction equipment adults can try out at Diggerland XL. Diggerland was designed as a place for kids to play on downsized or safety-modified excavators, backhoes, and asphalt rollers. What surprised the owners of America's only construction-equipment amusement park after it opened two years ago in West Berlin, Camden County, is the number of adults who were clogging up the ride lines. 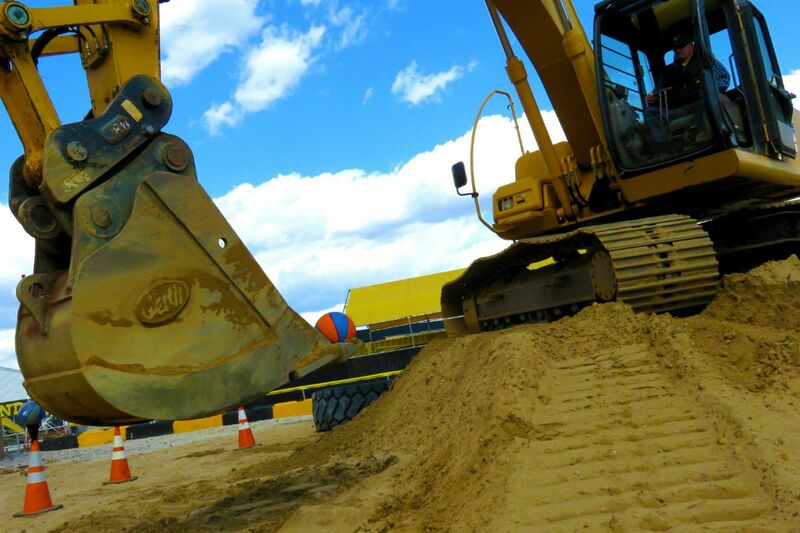 Enter Diggerland XL, the new adult sandbox where grown-ups get to try full-size wheel loaders, excavators, and bulldozers on for size for extra-large money. That's how this desk jockey recently found herself at the controls of an 18-ton bulldozer barreling with alarming speed toward a mom and her two toddlers. Since April, everyone from dads and moms passing the time while their kids explore Diggerland's smaller pleasures to senior citizens looking to cross "operate an excavator" off their bucket lists (pun intended) to bachelorette-party revelers have come to the park-within-a-park, says Ilya Girlya, Diggerland USA president, CEO, and XL instructor. And now me, one recent steamy Friday. I wasn't afraid of driving a bulldozer until I watched the two videos that begin Diggerland XL's conference-room orientation. The first, made by the park, amuses as it lays down rules such as no cellphones and no eating by showing a doofus ordering a delivery pizza from his heavy-equipment perch. The second is from John Deere and incomprehensibly technical - except for the warning that an inept operator (i.e. me) could be "thrown or crushed" with "fatal" consequences. Then Girlya and I walk out to a two-acre sandpit containing half a dozen slumbering metal giants, I climb aboard my steed, and Girlya begins explaining the controls - the majority of which are on the left side of the cab. This includes the all-important throttle lever, with its self-explanatory pictures of a turtle (for slow) and a rabbit (for fast) at its extremes. He also outfits me with a headset to hear his instructions and encouragement, and an attached walkie-talkie for questions. I execute his directions - to drive the dozer up a dirt hill and around an obstacle course of telephone poles - fairly well, if very slowly (to keep my brain in my head - the ridges on the treads make even the flattest surface feel like a rock bed). Still, sitting in the air-conditioned cab pushing buttons while Girlya paced in the dirt under the sweltering summer sun shouting orders, it seemed like I had the easier job. That is, until Girlya suggested I fetch a giant tire and push it up the hill of my former triumph. To do that, I needed to maneuver around a hole a fellow XLer had just dug with his excavator. That meant steering directly toward that family of innocent bystanders with my left hand, then awkwardly reaching over to the throttle with my right - so awkwardly that I pushed it into bunny-rabbit territory, and the giant machine leaped ahead with frightening speed. My walkie-talkie link to Girlya picked that moment to fall to the floor. Thank goodness I found the foot brake just as I saw the mom's eyes widen, so Girlya didn't have to use his kill switch. XL instructors have yet to use it with any adult student, Girlya says. "You may be the closest I've come," he adds - unnecessarily, I thought. My bulldozer performance went downhill from there. I was surprised when Girlya suggested I try to center the tire on my plow before losing contact with it entirely. With the blade blocking my view, I thought I was doing fine. I also failed the extra-points exercise to fill the hole I'd created while pushing the tire. Even the pros can't always see what's in front of the blade. It takes practice, Girlya reassured me during my XL debriefing. You can get that practice by enrolling in the heavy-equipment-operator school that has posted a banner ad on one wall of the XL sandbox - a brilliant act of target marketing that did not work for me. Diggerland XL is fun for a day, but in the interest of a safer America, I'm going to stick with my usual work, typing on little machines. Diggerland XL Diggerland, 100 Pinedge Dr., West Berlin, N.J. $199 for 1.5 hours on one machine, or $349 for three hours split between two machines. Ages 18 and older only. 856-768-1110.